Every 2 Hours Someone Gets Arrested for Pot in D.C. When it comes to marijuana, D.C. has a higher arrest rate, more racially disparate arrests and spends more money on enforcement than almost any other jurisdiction. Between 2001 and 2010, while overall drug arrests have dropped, marijuana arrests have risen by 18%. In the District, marijuana arrest rates have risen by 61.5%. D.C. police made a total of 5,393 marijuana arrests in 2010 — nearly 15 arrests a day. When compared on a county level, D.C. ranked as the county with the 7th highest arrest rate of the 945 counties examined. Overall, marijuana arrests account for 46.9% of all drug arrests in the District. 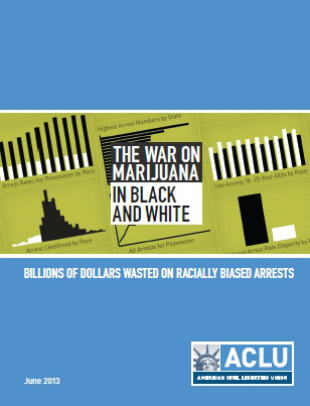 As the number of marijuana arrests has increased, so have racial disparities, despite roughly equal usage rates. In D.C. slightly more than half the population is Black, yet 91% of all marijuana arrests were of Black people. Between 2001 and 2010, while the number of white people arrested for marijuana has stayed about the same, the number of Black people arrested rose to 4,908 from 3,228. Marijuana arrests in the District aren’t just focused on teenagers and young people. In contrast to national trends, in 2010, there were more people arrested for marijuana aged 30-39 then aged 25-29 or age 18-19. Officers from fifteen different police forces in the District made marijuana arrests in 2010, however MPD officers made 4,996 of the 5,393 total arrests, or almost 93%. The MPD is divided into seven Police Districts, which are further subdivided into Police Service Areas (PSAs). Arrest rates vary greatly across Districts and PSAs. The MPD is divided into seven Police Districts, which are further subdivided into Police Service Areas (PSAs). PSA 602, located in Anacostia, had a 2010 marijuana arrest rate of 2,488 per 100,000. By contrast, PSA 204, located in Woodley Park, had a marijuana arrest rate of just 33 per 100,000. Join the ACLU in our call to the D.C. Council to end penalties for possession of small amounts of marijuana. Follow us on Twitter (@ACLU_DC) and Like us on Facebook (facebook.com/aclu.dc). The War on Marijuana has become a needless and costly war on people of color. 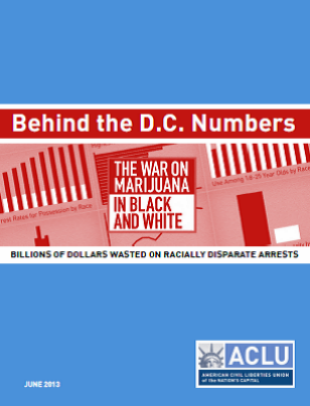 In 2010, more than 90 percent of the people arrested for marijuana in D.C. were Black. The aggressive enforcement of marijuana possession laws needlessly mires thousands of people in the criminal justice system, crowds our jails, wastes millions of taxpayers’ dollars, fails to reduce marijuana use and availability, diverts precious police resources away from solving serious crimes and is carried out with staggering racial bias. Join the ACLU of the Nation's Capital and tell the D.C. Council it is time to eliminate criminal penalties for low-level possession and use of marijuana. Were you or someone you know arrested for marijuana? Send your stories to intake@acludc.org.